When Buckeye Firearms Association's Larry Moore first sounded the alarm bells about why gun owners needed to pay attention to State Issues 2, 3, 4, and 5, many Second Amendment supports probably wondered what the Issues had to do with their gun rights. Our answer was simple - a fair and open elections process has everything to do with our gun rights, and the anti-gun people who were trying to change all that needed to be exposed for what they were. Less than two weeks prior to the election Buckeye Firearms Assocation Vice Chairman Chad Baus recounted the need for "no" votes on these issues on NRANews' Cam & Company. Last week, State Rep. Kevin DeWine was a guest on the same show, and again urged gun owners to vote "no". Monday afternoon and evening saw the NRA-ILA inform all Ohio NRA members to vote "no" on Issues 3 and 4 via both email and a phone bank. Gun owners and Ohio voters responded. Ohio Issues 2, 3, 4, and 5 were all soundly defeated in county after county throughout the state! One local issue also brought good news to the residents of the City of Loveland, where voters (yet again) said "yes" to opening a state-of-the-art indoor shooting range and "no" to a few anti-gun extremists who have opposed it for well over a year. As a part of our expanded focus on general firearms issues, this political action committee directed our attention to an increasing variety of local races in the state of Ohio. Local races deserve increased attention from persons who vote their Second Amendment Freedoms first, because in the wake of loses at the Federal and State level, gun ban extremists are increasingly turning their efforts on passing gun control at the municipal level, and also because the traditionally low voter turnout in off-year elections means it takes fewer votes to turn an election. In 2005 there were a few contests which piqued the interest of Buckeye Firearms Association, some because they were between pro-gun candidates and out-and-out liberal anti-gunners, and others because we wish to support pro-gun candidates in positions that could one day lead them to the Statehouse or Governor's mansion. These contests aren't by any means "sure wins", and as the results show, there is much work left to be done in greater Columbus and Cleveland areas to see that more pro-gun candidates are elected to local office. 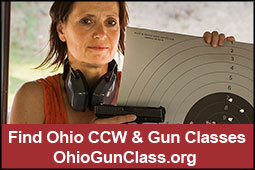 Click here for the entire list of 2005 Buckeye Firearms Association endorsees (winners as noted).